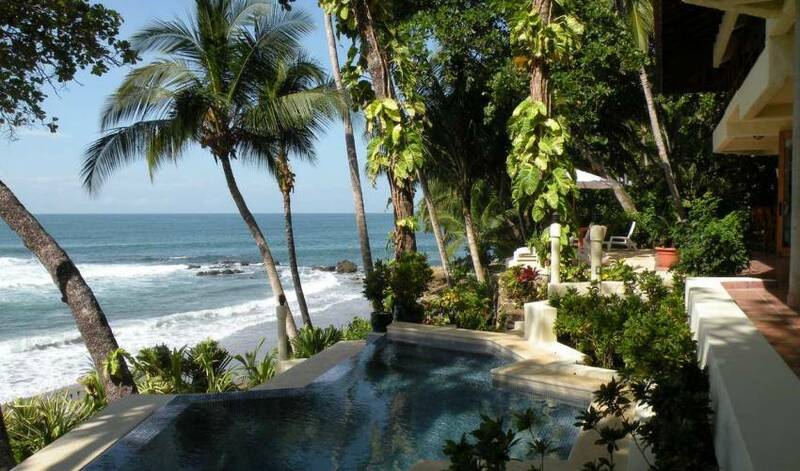 Villa 1600 is a true beachfront villa – a marriage of sea, sand, oceanfront infinity pool and luxurious accommodations. Experience tropical palms and colorful flowers as you’re just steps away from an equatorial ocean, as warm and comfortable as a mild bath. Take a refreshing dip, or just relax on your beach towel on our clean, sandy beach, soaking up the deepest tropical tan you can imagine. 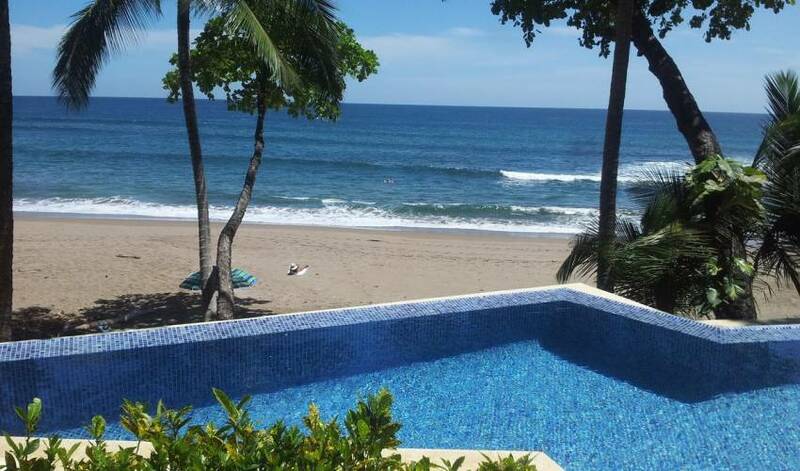 The villa has an beachfront infinity pool – where you can have a tropical fruit smoothy or your favorite “bebida” (drink) with your friends, or just indulge your private thoughts while watching the sun sparkle off the beach breaking surf. Isn’t this what life is about? Be prepared to slow down and be at one with your surroundings. This is more than a vacation; it is an experience in rejuvenation! Enjoy the shaded oceanfront patio and sun deck with comfortable lounge chairs. Inside is a large Mediterranean couch overlooking the Pacific, and toward the gourmet kitchen is an oceanfront dining area. The gourmet kitchen is appointed to meet the needs of our chef, so if you personally prefer to create your own culinary masterpieces, you will find everything you need. The principal master suite is accessible by a sky lighted staircase accented with terra-cota colored ventilation blocks. The king size bed is in the center and leads to a deck outside overlooking the Pacific Ocean and the infinity pool. The back patio of the master suite overlooks the garden and jungle. The jacuzzi tub overlooks the beach and ocean, and the oceanfront patio is directly to the left. The principal master suite was designed with complete openness and flow through ventilation to enjoy the tropical ambience, therefore making air conditioning unnecessary, but it is provided. 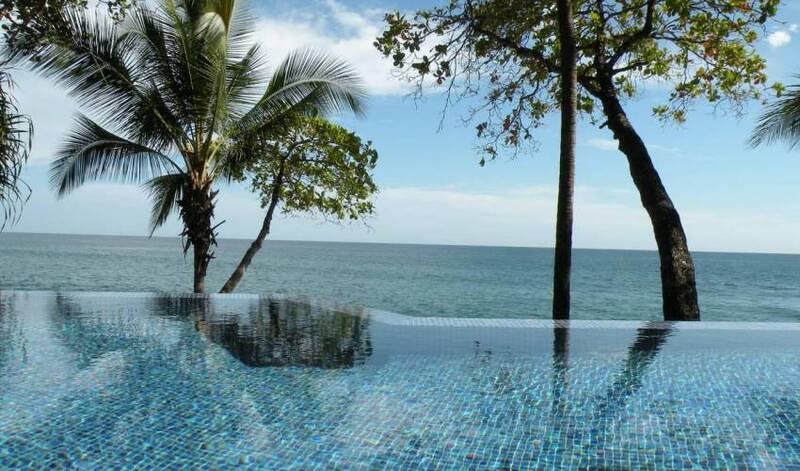 From the ocenfront balcony, read and relax overlooking the azure ocean and verdant, tropical foliage, and watch the howler monkeys pass by in the palm and almendro trees. You might even get an early wake up call occasionally from them, but they’re worth it! The Guest Master Suite has basically the same amenities as the Main Master Suite including an oceanfront balcony, but doesn’t have the back, garden facing patio. Take advantage of the flow through sea breeze ventilation, or if you prefer, air conditioning is available. The Jacuzzi style whirlpool tub has views to the beach and ocean. At night, enjoy premium channel satellite television while unwinding from the day. The Guest Master Suite overlooks the sun deck patio and the beach on the west side of the villa and has a king size bed. For those who must stay in touch during their stay at Casa Oceano, but didn’t bring their ipad or laptop, a computer station is part of the Guest Master Suite. Or, you can access the internet on your own device using the villa wi-fi system throughout the villa. Two bedrooms upstairs: Immediately to the right of the main entrance is a separate and private entrance to two additional upstairs guest bedrooms on the west side of the villa through a vaulted ceiling stairway. Both have air conditioning, ceiling fans and televesion. These two additional guest bedrooms each have cantilevered balconies, one has a whirlpool tub, flow through ventilation and both have air-conditioning. 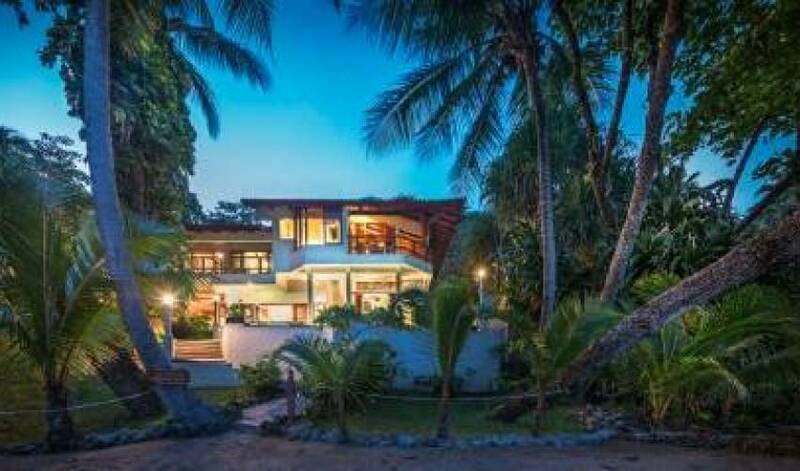 Enjoy the 180 degree, panoramic views of the blue Pacific, the sun deck and pool below, while sitting comfortably on your private, beachfront balcony. Two downstairs bedrooms: The oceanside downstairs bedroom has direct access to the oceanfront patio overlooking the infinity pool. The rear garden setting bedroom has two queen beds. Both downstairs bedrooms have air conditioning, ceiling fans and television. From the entertainment center and built in Mediteranian sofa, the main living area flows across the dining area and into the kitchen, all having a view to the ocean and beach. 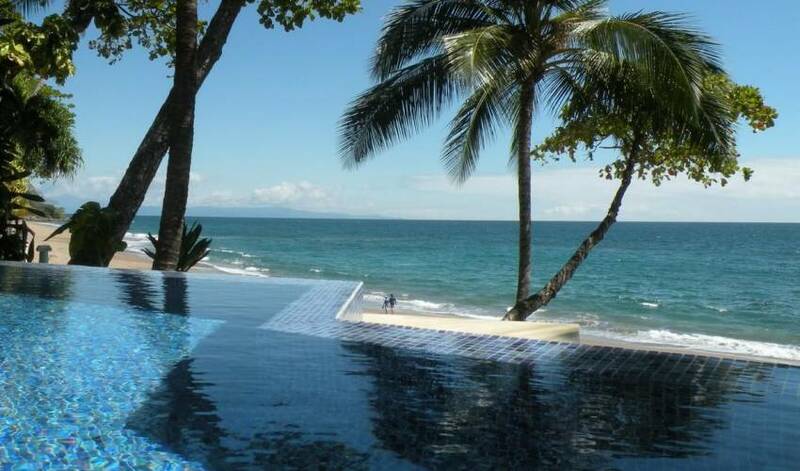 Probably the principal social area outside during the day is the oceanfront infinity pool, just 10 steps from the warm tropical sand. For those that have had their quota of sun for the day, closer to the villa are the overhanging balconies providing shade, yet close to other members of the family or party. At the eastern end of the villa is a small, private patio where one, or a couple, can read a book, have an afternoon drink, or early morning cup of coffee. 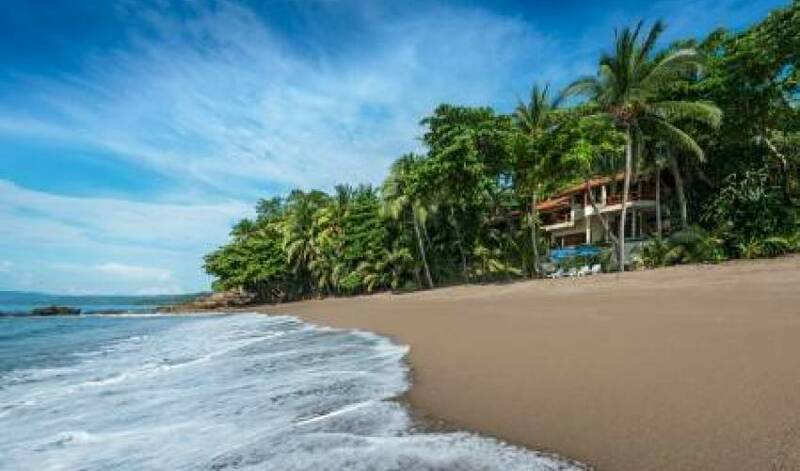 Villa on 1 kilometer of sandy, essentially private beach with Costa Rica Blue Flag Award for cleanliness and ecological standards. One of the joys of visiting foreign places is to be able to sample the indigenous and authentically prepared, local cuisine. At Casa Oceano, this is no exception. We offer a sumptuous meal plan with our own chef. Guests are treated to the best of local and international dishes prepared with fresh seafood, lobster, organic vegetables, and hormone free local filet mignon – three full meals with snacks in between. Specific dietary needs can be met for vegetarians and vegans. Children’s menus are offered, and of course, preferences are respected. Remember, this is your vacation. Why argue about who is going to shop, prepare food, wash and dry the dishes? We’ll do it all for you! Isn’t that what a real vacation is about – watching the sunrise or sunset with fragrances wafting from the ocean side kitchen as you sip your morning coffee or evening cocktail? There’s more than just a villa, there’s things to do! You’ll have plenty to keep you occupied around the villa and in the Tango Mar Resort. 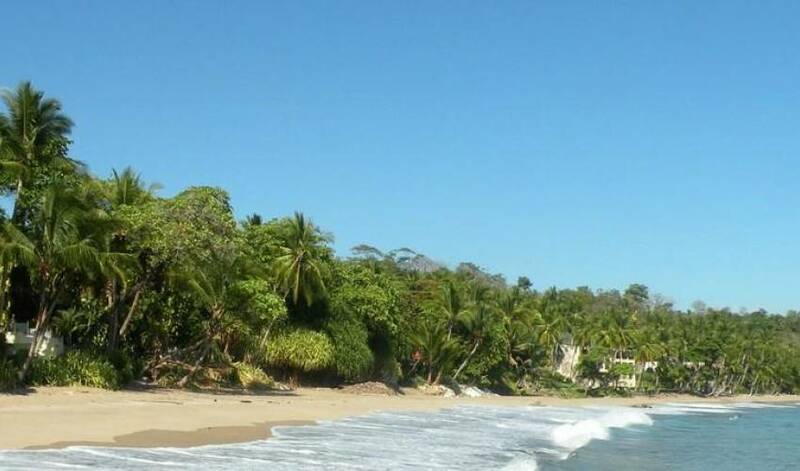 Boogie boards are supplied to adventurous guests that want to play in the surf, there are tide pools to explore or just languish in the warm water, take hikes to the nearby waterfall, horseback riding by the surf, monkeys and wildlife watching, and cultural experiences. Additionally, there are nearby tours which our concierge can arrange for you. Birthday or anniversary? Let us help you arrange your special date with bands, etc.